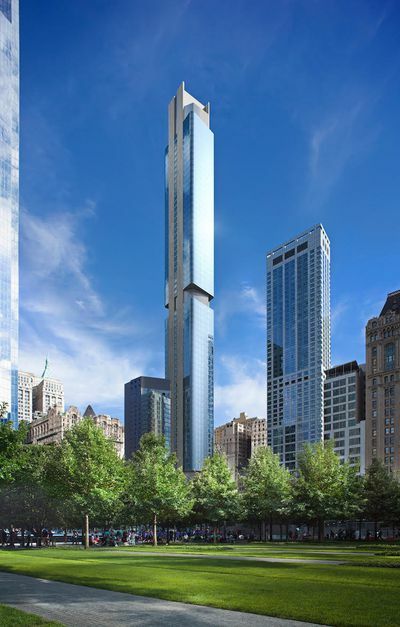 The super secretive skyscraper that is 125 Greenwich Street is finally moving forward, armed with a new rendering and plans to launch sales this fall. YIMBY first reported on the rendering reveal on the condo building that’s being designed by Rafael Viñoly Architects. Some of the details on the building have changed since we last reported on it in May 2016. The height on this skyscraper has changed a lot since it was first announced, going down from supertall status to regular skyscraper level. Last May the developers stated 898 feet, but now that’s inched up slightly to 912 feet. The Bizzi & Partners and Vector Group-developed condo will have 88 stories and 273 apartments spread between them. Apartments will come in studios through three-bedroom variants, and the building will feature a suite of amenities on the top three floors. This condo has been in the works since at least 2014 with no evident start date, but recent news of the developers acquiring a $450 million construction loan is a sign that the project is in fact making progress. Stay tuned for more details on the condo as it gets closer to the sales launch this fall.